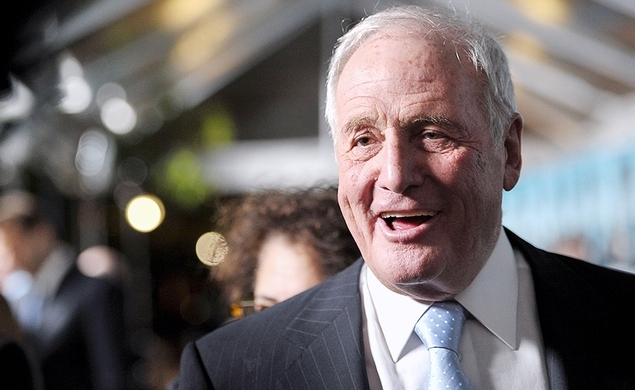 Jerry Weintraub, old-school mega-producer, talent manager, concert promoter, and all-around raconteur, has died. Over the course of his very long career, he worked with a staggering list of musicians, bands, and film directors, including Elvis Presley, Frank Sinatra, John Denver, Neil Diamond, Bob Dylan, Dolly Parton, Led Zeppelin, the Beach Boys, Robert Altman, Barry Levinson, Carl Reiner, William Friedkin, and Steven Soderbergh. He went into cardiac arrest yesterday afternoon at a Santa Barbara hospital while with his family and did not recover. He was 77 years old. Weintraub was born in 1937 in Brooklyn, the son of a traveling gemstone salesman. While a teenager, he was such a regular sight at the movie theater that he was offered a job as an usher there, and shortly thereafter he joined the Air Force, with which he was stationed in Alaska. He was drawn back to showbiz, though, and after his stint in the military, he quickly found a career in it. Starting at the bottom as an NBC page and a mailroom clerk at William Morris, he soon became an agent at MCA, but MCA could contain neither his outsized personality nor his outsized ambition, and he formed his own management company with Bernie Brillstein and Marty Kummer in 1960. During his time as a talent agent, he discovered John Denver and organized the first real nationwide arena tours for any artist—in this case, Elvis Presley and Frank Sinatra, who he singlehandedly brought out of retirement. The success of these tours brought more and more artists to his management company, but Weintraub’s interests soon shifted. After breaking into television for the purposes of promoting the musicians he managed—the John Denver’s Rocky Mountain Christmas special being a prime example—he got into film producing and proved massively talented at it. His first project, Nashville, in 1975, was a box-office success and garnered great acclaim, including a Best Picture nomination. Over the following 40 years, he produced a wide-ranging group of films, including Oh, God!, Cruising, Diner, the original Karate Kid, all of the Karate Kid sequels, the Karate Kid remake, and the entire run of Steven Soderbergh’s Ocean’s films. Most recently he returned to TV, with the Liberace biopic Behind the Candelabra for HBO, which went on to win 11 Emmys and two Golden Globes. And he never stopped working—at the time of his death, he had several projects in the works, including the currently airing black comedy The Brink, also for HBO. Jerry Weintraub was as legendary for his storytelling as he was for his name-dropping, but that tends to come with such a career. In 2010, he landed on the New York Times’ bestseller list with the memoir When I Stop Talking, You’ll Know I’m Dead: Useful Stories from a Persuasive Man; now that he has stopped talking, it’s everyone else’s turn to tell stories about him. One can only imagine the ones being told all around Hollywood today.